The Tomie dePaola Illustrator Award competition is an annual contest in which members of the SCBWI (Society of Children's Book Writers and Illustrators) are challenged to illustrate a piece of text from a story selected by dePaola himself. As a successful illustrator and writer, Tomie dePaola, whose books include Strega Nona, Pancakes for Breakfast, and The Knight and the Dragon (just to name a few), selects an illustration that embodies a unique style and vision. The winner is not only awarded a $1,000 gift certificate for art supplies, but also receives a fully funded trip to attend the New York Winter Conference in Manhattan. This year, the challenge was to illustrate some lines of text from the story "Chicken Licken," in which Turkey Lurkey finds Chicken Licken, Goosey Loosey, Henny Penny, Cocky Locky, and Ducky Daddles rushing to tell the king that the sky is falling. After being persuaded by the hysterical group, Turkey Lurkey decides to join them on their journey to the king. With the announcement of the Tomie dePaola Illustrator Award winner only a few days away (January 9th to be exact), I decided to post my interpretation of the excerpt before the award is given out. 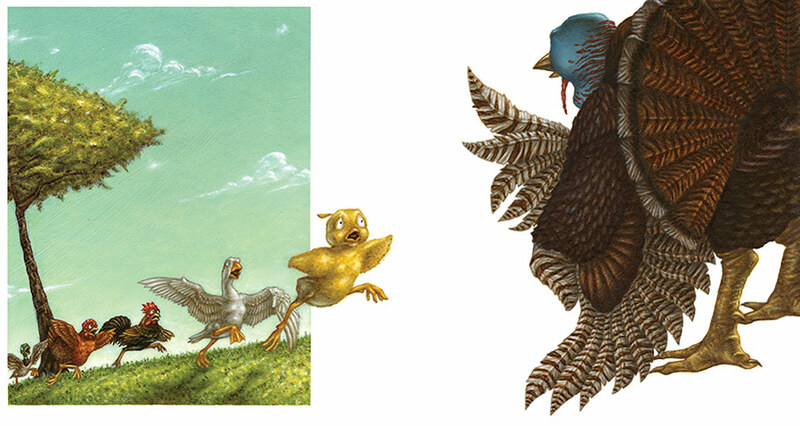 There are many unique, well rendered approaches to the "Chicken Licken" text by the talented illustrators of SCBWI up for view at the SCBWI Contest Gallery. I highly recommend checking out their versions to see the stunning diversity of compositions, styles, and designs. Good luck to all those who have submitted to the competition!